Not knowing how a dish will turn out is a mixture of scary and exciting. That’s how I felt while making this. I made the base out of fresh green zucchinis, Trader Joe’s sprouted high protein tofu, and some of my very own sprouted dehydrated buckwheat groats. I then had some delicious TJ’s pizza sauce along with their olive tapenade. All of these ingredients are yummy, so why can’t they be yummy together. I will admit, I was feeling cranky and pessimistic regarding the crust. I don’t know or do much with tofu. It’s just they way our relationship is. I know that I like firm tofu the best and that it is good practice to drain the tofu, slice it, and then press it to drain the excess water. Although since I wasn’t making a stir fry – I didn’t do the pressing bit and that was okay. I just hoped that because I was combining it with other tasty things it would turn out good. The entire time it was baking, I was imagining what we’d eat if this flopped or where we’d get take-out from. Jeremy, on the other hand took one look and one sniff and said, ‘Well I’m going to eat the hell out of whatever it is’. I love that attitude and it helped get me a little bit more excited. I’m lucky he’s so open-minded. I initially was going for something pizza like, you can see that by the layers and ingredients, but the crust although crispy on the edges was a little fluffy kind of like an egg casserole yet different. Either way it tasted delicious! We cut this yumminess into 10 pieces but then we ended up basically splitting the dish between the 2 of us. So? It's up to you - it could be a side for a few people or 1 meal for 2. Add zucchini, 1 tablespoon olive oil, and garlic to a food processor fitted with the s-blade. Process until finely ground almost dip like, add tofu and process until all tofu, buckwheat groat flour, salt, and Italian seasoning and process until incorporated. This process may involve scraping down of the food processor or even 'batch' processing depending on the size of your food processor. Take 1 teaspoon olive oil and oil a large cookie sheet, proceed to empty out zucchini/tofu mixture onto oiled cookie sheet and spread evenly into a rectangle shape. Bake at 380F for 50-60 minutes. Toss arugula and 1 teaspoon olive oil in a bowl to coat. 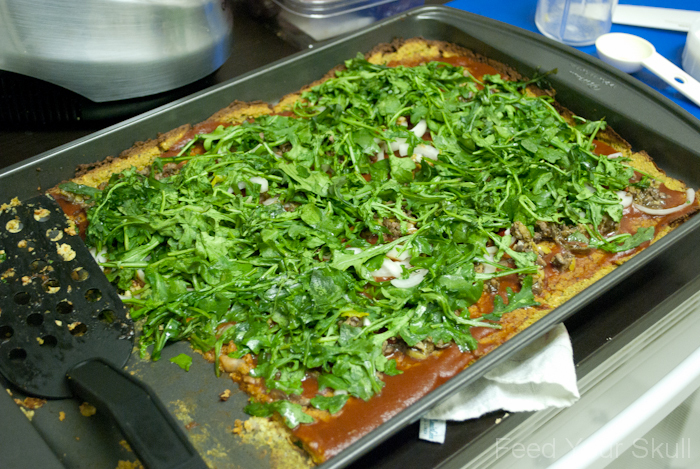 Pull zucchini/tofu base out of the oven and spread with pizza sauce, onion, olive tapenade, and oiled arugula. Place back in oven and bake for 5-7 minutes. Cut into desired shapes and enjoy! This is what the ‘crust’ looked like before baking. I just used a regular old, large cookie sheet. 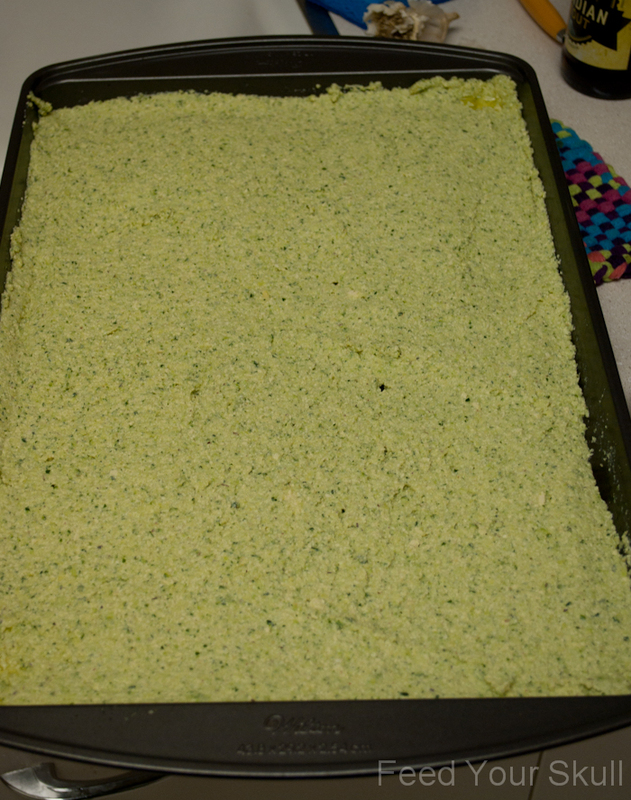 While baking, the water content of the zucchini evaporated like crazy and for as long as it was in the oven, the bottom wasn’t anything more than a golden brown. I checked on it every 10-15 minutes and kept track of the time that way. The toppings had just been placed and this baby was about to go back in the oven for the last 5 minutes. Have you had arugula before, did you know it’s called Rocket in Europe and that both perennial and annual seed varieties are available ? It has a fantastic peppery flavor that I really enjoy having with a sliced avocado and a light mustard dressing. Here it is out of the oven with the first two slices missing. 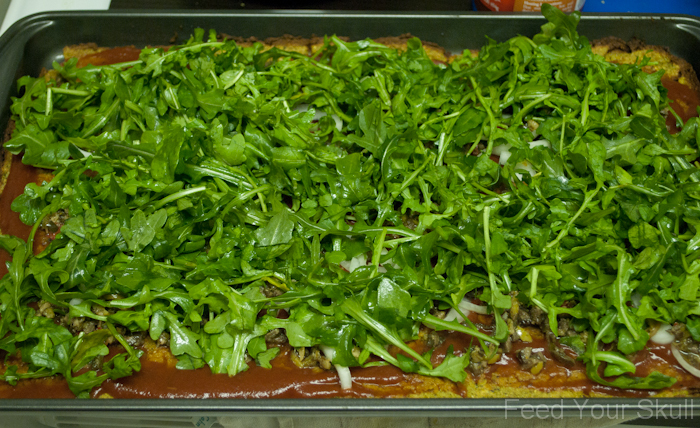 The arugula softened and settled down a bit, but not enough that it overcooked – it’s still fresh and vibrant in appearance! If you make this I would love to know what you think! 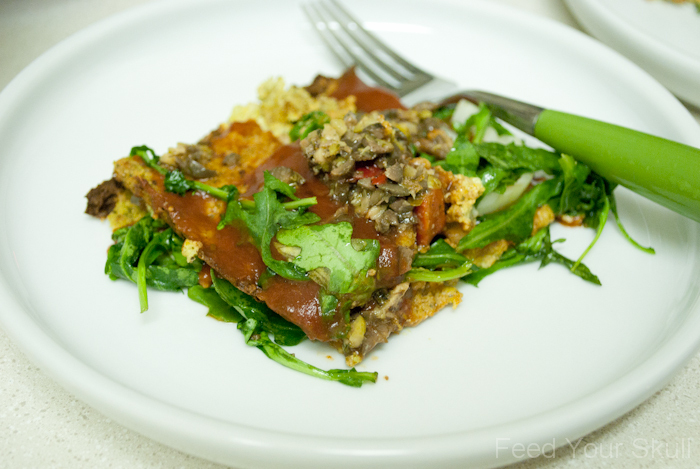 Have you tried arugula before and do you like its spiciness? I love it and believe I acquired the taste when I started eating more greens, so I’m very thankful for that. I love arugula and have grown it in my garden for several years. Planted from seed, it comes up within a week, is almost impossible to kill, slugs don’t really like it and my chickens ignore it! I’ve never had it baked and this recipe looks so good I may have to try it. I’ll be adding cheese to it, too.